If you have been struggling with making your own gaffed cards, printing your own deck of cards, or if you always wanted to put uncle Joe's face where the Jack of Spades is, then now this has become a lot easier and cheaper than ever before. The method I will describe here results in cards that are identical in look and feel to regular USPCC cards. And the best of all of this is that you can do this for a few cents per card right at home. The problem with all known traditional methods is that they start with an already printed card. Either you have to split the card, cut it in pieces and then reassemble via some form of gluing, or you had to remove the overcoat (by sanding or with some kind of chemical solvent for example aceton) that would then allow you to print your own design on the card. These methods are messy, take a lot of time, and are quite limited in what kind of cards you can make. When I started to tackle this problem it became quickly clear that the only way to really improve the DIY making of playing cards was to start with a blank uncoated card stock on which one can easily print with laser or inkjet printer. The only problem was that you can't buy playing card stock at Staples or your local office supply shop. So I went on a mission to find out if one could buy playing card cardboard. And in particular I wanted to find the same cardboard that USPCC used including their 'air-cushion finish' which is used for their line of Bicycle cards (see photo to the right). Bicycles are the most popular brand. If the intention is to print gaffed cards for magic purposes then it better be identical to the Bicycle dimpled surface and snaps and looks exactly like it. To make a long story short, I found the source. The caveat is that you can't buy a few hundred sheets. You have to buy a 'truckload'. And I mean this literally not figuratively. I decided to buy ONE truckload, break it open, and sell small quantities to people who want to print their own playing cards or gaffed cards that look and feel just like the real ones. And once I had the right cardboard I made breakthroughs both in coating cards and in cutting cards. The first breakthrough was on the cutting side. You can do cutting in many different ways but if you want to combine your self-made cards with store bought cards, or if you want to produce an entire deck or perhaps even many decks of cards, then the cutting has to be accurate. Otherwise your self-made card will not blend with regular cards and your deck will look and feel wrong if every card has a slightly different size. My investigation and testing resulted in a perfect solution for the home maker of playing cards. You need two tools. A card cutter and a corner rounder . These two tools allow you to efficiently cut cards to perfect size with perfect corner rounding. The remaining piece of the puzzle was the coating or varnish of a card. The coating protects the card as well as gives it the right slip to allow easy dealing, fanning and shuffling. And just as with the cardboard I went right to the source professional card manufacturers use. I found a supplier of playing card coating and I found a cheap and easy way to apply the coating. Job done. Now we can print, coat and cut cards to perfection in a DIY process and produce perfectly looking high quality cards. When I do show my cards to friends and colleagues and tell them that I printed these cards myself their first reaction is disbelieve. They think I try to pull their leg. They check if it is not April 1st fools day. They simply can't believe it. But it is a reality now. You can print anything from a few cards to setting up an entire business printing cards for sale. This is a photo of five cards I made myself. They have standard faces and Bicycle backs. The ace of spades has been modified - all text has been removed as proof that I am not taking a picture of store bought cards. The purpose of this photo is to show that they look exactly like regular cards. If you use the process I am outlining here you will be able to do the same. This is a photo of a commemorative custom deck I made for my parents for their 70th birthday and 45th wedding anniversary. At the bottom left you see the custom back which is a modified Bicycle back. Next to it two self-printed Bicycle backs one in blue and one in red. The deck is not a full deck only from 9-10, J, Q, K, A, plus 3 special cards, one with a magic square. 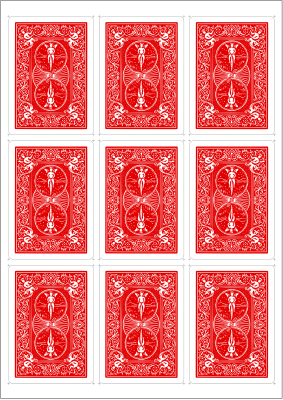 High quality playing card cardboard has a specific structure. It consists of two layers of cardboard which are glued together with a black glue. 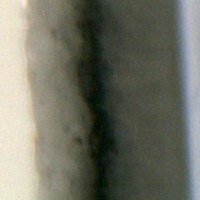 The blackness of the glue comes typically from graphite which is added to the glue. The exact composition of this glue is typically a trade secret but its purpose is to achieve total opacity of the card as well as to give the card the correct snap and feel. Below you can see three cross-sections taken with a digital microscope at 180x magnification. The left most is from a Bicycle card. The middle one is our Lybrary.com cardstock and the right image is from a Piatnik card, the Austrian card manufacturer. You can clearly see that all have two layers of cardboard which are held together by a black layer in the center. This is the black glue that assures opacity. A color laser printer or inkjet printer that can handle thick cardboard, or a local printshop (Kinkos in the US) that has a good digital printer to print on cardboard. I personally used the Brother HL-4070CDW but the fusing of the toner was not perfect. I now have an OKI C612 which is much better. The key is a good straight paper path. From the many laser printers I tested ranging from HP, Dell, Lexmark, Rico, ... the Brother 4070 had the best single sheet feeder and was affordable. Also the Xerox solid ink printers do work very well. Some of the most suitable laser printers are from Okidata, but they are not that cheap. The C612 I have now has cost a bit more than $600. I also had reasonable good success with a small Canon iP-100 inkjet printer. genuine playing card coating and an 8" hard rubber hand roller or Brayer. A method to cut your cards. Straight edge and box cutter is the cheapest solution. But accuracy is low and the effort necessary is high. Straight line paper cutter or trimmer. There are many models to choose from. Accuracy is low but it is easier than with the box cutter and straight edge. KardKutter. Your best solution is our playing card cutter [has been discontinued due to manufacturer going out of business]. It cuts exactly sized cards effortlessly and burr-free. And if you plan on making a bunch of cards over time you will quickly realize that the cutter will soon pay for itself. Die cutter. The ultimately best solution would be a die cutter that cuts a card including the correct corner rounding in one step. However, die cutters for the exact dimension cost hundreds of dollars for one single card. You can find 8-up die cutters but then you should be prepared to pay upwards of $2000 for such a cutter. Unless you want to setup a business making custom cards a die cutter is not an economical solution. A 1/8 inch (3 mm) corner rounder . If you plan on rounding thousands of cards you should look into table top models which go for around $150. Lassco is one company that produces nice models but there are other manufacturers and several models to choose from. Design a card in your favorite drawing program or with my free online card designer. Another way to start is to scan in some faces and backs and modify them with a drawing program. 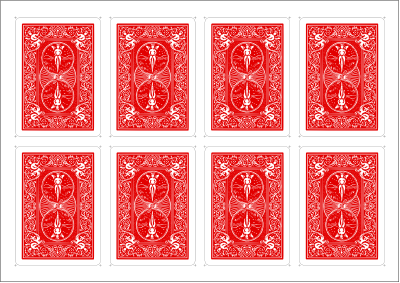 A cleaner way is to start with our 52 Standard American card faces as vector files. You can easily modify these graphics with any vector graphics design tool like the free Inkscape or the not free and not so cheap Adobe Illustrator. Print it out on the playing card stock. In most cases you will have to run the sheet through your printer twice to print front and back. Coat the sheet front and back with our genuine playing card coating . For some applications you can even skip this step. The cards particularly when printed with a laser printer do look already great without overcoat. Cut the cards from the sheet. I recommend and use myself the KardKutter [has been discontinued due to manufacturer going out of business] and a corner rounder . But you can certainly use other methods, too. Impress your friends with your self-made playing cards. That's it. There is not much more to it. The only step that is a bit messy is the overcoating. But for some applications you can skip this step. The card stock has a natural sheen and unless you need to do extensive sleight of hand with these cards or want to mix and match with regular cards you could do without overcoat. They will not last as long as the coated cards but now that you can print them out for mere cents it doesn't really matter. Most of the printing I have done so far was on my Brother HL-4070CDW color laser printer and my Canon iP100 mobile inkjet printer. One key setting in the print driver is the paper setting. Playing card cardboard is a pretty heavy cardboard. And if the settings are not correct the toner will not fuse or not fuse completely to the cardboard if you are using a laser printer. The fusing is typically done with heat. A thick cardboard absorbs more heat leaving less for the toner to melt and fuse into the surface of the sheet. Therefore, if you use a laser printer, make sure to select in the print driver 'heavy cardboard' or some similar setting for the paper quality. In my laser printer the options that work well are 'Thicker Paper' and 'Postcard'. Otherwise the toner will not completely fuse to the cardboard. This is crucial. The prints will be unusable otherwise. My Brother HL-4070CDW works but it is used outside its manufacturers specs. And therefore sometimes if the printer is not warmed up properly the fusing is not complete. Upgrading from a consumer class printer for $200-$400 to a business class printer for around $1000 will improve the situation because these printers are built to handle thicker cardboard. How do you check if toner has not been completely fused? If you run your finger over a printed area you will feel the loose toner. It feels rougher than a properly fused area. And you will get some toner on your fingers. You will also see faint ghost images in areas that should be white. With some experience you can tell by simply looking at the print. There is one important thing I found out. Do not print directly from Inkscape. For whatever reason Inkscape does not pass on the paper settings to the printer. This means that your 'Thicker Paper' setting will not take effect and your toner will not fuse completely leaving you with an unusable print. There is an easy fix to this. Save your design to PDF, then open the PDF in Adobe or AdobeReader and print from there. Problem solved. The tell tale signs for this printing issue to happen are that the paper emerges from the printer faster than it should. And that the 'preferences' window does not properly close after you selected the 'Thicker Paper' setting. For more information on pigment versus dye inks see www.oddparts.com/ink/faq19.htm. A colleague reported that the Xerox solid ink printers (he used a Xerox Phaser 8560/DN) do work very well and the ink bonds to the cardboard perfectly. The duplexer does not work with the thick cardboard and you will have to print front and back separately. This printer costs ~$700 new. Probably the best and lowest cost solution to get started is to use the services of a print shop. I had Kinkos print 10 sheets front and back on a color copier and the result was wonderful - beautiful colors. I think these color copiers use a chemical to fuse the toner, not heat, which makes the print quality very good. I paid $1.18 for each printed side. Other printer alternatives. I have no direct experience with them but searching online, reading reviews and articles I found these interesting candidates. One of the main issues with laser printers is being able to handle heavy cardboard. In general office laser printers in the $1000 price range will typically handle thicker cardboard better than the standard low cost home laser printer in the $200-$400 price range. In general you want to go with the ones that can deal with the thickest cardboard. For example the Ricoh Aficio SP C411DN is a color laser printer that costs a bit north of $1000 and can deal officially with cardboard of 216gsm or less. Most other small home laser or office laser printers can print on 160gsm. Okidata offers an interesting line of color laser printers that can handle heavy stock at affordable prices. For example, the Okidata C330 prints up to 220gsm $400, and the Okidata C610 even up to 250gsm $700. Xante Ilumina Those who want to go professional with this card making idea might want to look into the Xante Ilumina color laser printer. This printer does print on very heavy cardboard up to 500gsm which is much heavier than the typical 300gsm playing cardboard. However, this printer costs around $4000 and is therefore not a viable alternative for most DIY card makers. Another printer in that class is the OKI C942. Actually I have read that the Xante is a modified C942. In many cases you will not need to color match your print because you are printing out all cards for your trick - gaffed and not gaffed. Since it is now much easier to print an entire deck of cards color matching has become much less of a concern than it was in the past. However, if you need to color match your prints, then read on for some tips of how to do that. One note before you dive into color matching. Have the deck you want to color match in front of you. USPCC is known to have a weak color quality control. You can find decks with very different colors. In some cases the red is already more a pink and the yellow can be a deep orange, blue can exhibit various degrees of darkness, etc. That means there is no universal 'USPCC red' or 'USPCC blue'. The least sophisticated method is simply to try as many shades and variations until you get close enough. The best is to do this systematically and print out sheets of slightly different colored squares and compare to the color on the card you want to match. The pros use sophisticated measurement equipment to define colors and measure color profiles of printers. There are services that do that for you at reasonable prices (take a look at www.cathysprofiles.com who is measuring profiles at $35 a piece). Another alternative is to buy a Colormunki (www.colormunki.com). The Colormunki is a spectrophotometer that helps a great deal in matching colors. It costs about $350 and is therefore not something everybody will immediately buy. The pros who need to repeatedly color match will want to get one. For the rest we can provide some help - read on. Frank Lehmann was so kind to measure four Bicycle decks from different print runs with his Colormunki. The results are tabulated below. Please note that the yellow and blue measurements are probably somewhat off because there is not a large enough area of blue or yellow on a playing card which allows a clean measurement. Nevertheless, I think the numbers should be reasonably close. As you can see the USPCC colors differ from deck to deck. But Frank's measurements do give you an idea where to start. This set of numbers is only half the story because your printer is not yet profiled or calibrated to really print out the colors you tell him to print out. Nevertheless, with these measurements we have at least defined one side of the problem and specified the colors we need to match. The best time to coat cards is after you have printed them and before you cut them out. Our playing card coating can be applied with a hard rubber roller or Brayer as they are typically called, a Preval sprayer or an airbrush. You can find 8" wide rollers for about $10 in your local art supply store or order it online at various stores. Get a legal sized clip board (the letter sized are too short) or any other board with a flat smooth surface. Put first a layer or scrap paper or newspaper on the board to absorb any excess coating. Then tape or clip your printed cardboard on top of it. Now you take the bottle of playing card coating, open the spout and dispense a line of coating across the entire top width of the cardboard. I actually put a tape across the top edge of the cardboard and dispense the coating on the tape. This prevents that too much liquid gets absorbed by the cardboard before it can be spread out causing the cardboard to get wavy. After the coating as been dispensed on the top I take the roller and with one medium pressure stroke roll the coating over the entire sheet. A kitchen towel is used to clean the roller for the next coating sequence. While I clean the roller the coating dries. Once the coating has been spread thin over the cardboard it dries very fast. I typically wait no more than a minute or two and then repeat the same process for the sheet's back side. For those that don't mind a little project I suggest to build the following coating machine. I figured out how to build for a few bucks a nifty manual coating machine that coats a sheet of cardboard on both sides. The photos shown are from my first prototype built from two 4" hard rubber hand rollers, and some hardware taken from the Vex robotics kit. Above you can see the nifty coating machine. 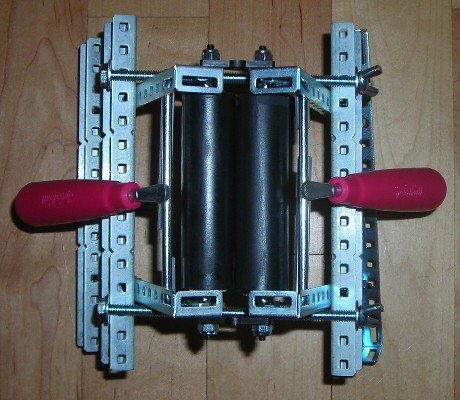 Two rollers are positioned next to each other. 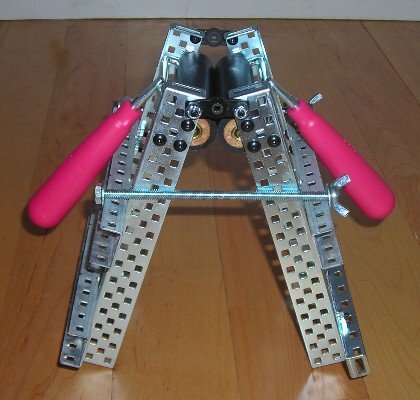 The long screws are there to adjust the pressure with which the two rollers are pressed together. Only a small amount of pressure is necessary. Essentially the rollers kiss each other. Below you can see how a piece of cardboard (here a 4.25" wide piece) is fed through the coating machine. To coat the cardboard a small amount of coating liquid is put into the groove formed by the two kissing rollers. The liquid will stay in that groove and not run down, because the rollers touch each other. Then a sheet of cardboard is inserted from the top into the groove between the rollers which holds the coating liquid. First push the cardboard down and then pull the cardboard through the rollers from below. This will uniformly coat the cardboard on both sides. It works great. For easy cleaning the machine can be opened up as shown below. 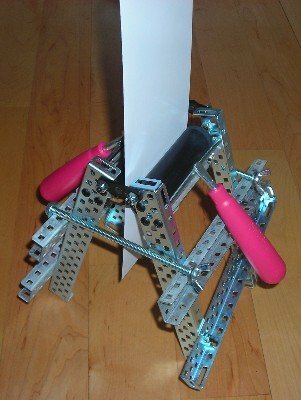 My next step is to build this machine from two 8" rollers so that one can feed an entire A4 cardboard sheet through it. The cost of one 8" hand roller is typically $10. The hardware I am using is great for prototyping but is not necessary. Two wooden boards to which the rollers are mounted and a few screws should be sufficient. You can also spray-on the coating. A cheap way to do this is with a so called 'Preval sprayer'. This is essentially an 'airbrush in a can'. It consists of a pressurized spray can that has a diptube sticking out from its bottom. A glass jar filled with coating is screwed to the bottom of the sprayer. This sprayer can be bought for $5 at Home Depot or for a little more via Amazon.com. Follow the instructions on the packaging. You will also have to remove the filter at the bottom of the diptube. Experiment with dilution ratios or use the coating as is. A card maker colleague shared the following recipe for airbrushing the coating. He used 1 part water to 2 parts lybrary.com playing card coating to somewhat dilute the coating. Then he used an Iwata Eclipse HP-BS airbrush gravity top feeder a little more than 1/2 tsp to a side. With an airbrush you will achieve a much better and finer control of your coating. ACE Clear Enamel: This is a coating not primarily for paper but for wood and other hard objects. It has a somewhat rough feeling, doesn't slip well, and smells for a while. Not recommended. Rustoleum Clear Enamel: Same as for the ACE brand. Not recommended. Krylon Kamar Varnish: It feels somewhat slick to the touch, does not smell but does not produce slippery cards - not enough to produce a good fan and nowhere near the feeling you are used to from store bought cards. If you work the cards, slide them against each other, shuffle them, etc., they become a bit better a bit more slippery over time. Krylon Crystal Clear Acrylic: Not as smooth and slick to the touch as the Kamar one. Damar Varnish: Stay away from this one. Smells a lot. Soaks too much into the card itself. Another option would be to use self-laminating sheets, but I am not sure how the air-cushion dimples would work in combination with such a lamination sheet. It might produce a lot of air bubbles. One would have to find a particularly thin one. I have seen such films in 3mil and 2mil thicknesses but have not yet tried it myself. I think that this would produce too thick a coating. A sales rep at Drytac suggested their 'Digital Gloss UV' liquid coating. The problem with this type of coating is that it needs to be cured with UV light. I don't know if one can create a home process to do that. Drytac did run a sample for me that produced a pretty good coating. But these UV coats are not entirely safe to use and not entirely environmentally friendly, and therefore not your best option for a DIY process at home. There are several other brand names for clear coats in spray cans, from SureGuard and other manufacturers. However, my feeling is that none of these will really produce a playing card finish. Giclee Spray E550 (www.mandev.co.uk/acatalog/Giglee_Spray_Systems.html) This is a nice not too expensive spray gun. Eterna Giclee EZCoater 38 (www.mandev.co.uk/acatalog/Laminators.html) This machine applies a uniform liquid coat. It is too expensive for the casual card maker but perhaps for the power users here it might be a great tool. Looking around for airbrush kits I stumbled on airbrush units for tanning like the Viatek I-Bod. They sell for below $50 and are cordless making usage easier. Should you need to use a UV curing liquid coat you will need the right UV lamps. 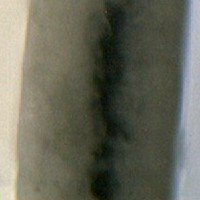 Curing is typically done with UVA or long UV light. That means that all kind of tanning lamps should work. I think particularly the Bion Face Tanner (www.folica.com/Bion_Face_Tanne_d1988.html?s_cid=paffk232270) could work well (~$100). Or perhaps even much lower wattage Blacklight lamps could do the job. Also for mineral identification purpose UV light is used. At mineralab.com they have some nice mini UV lamps. You would need the LW type for $37. Here is another portable UV curing system by Uvitron: PORTA-RAY 400R. I could not find a price. Believe it or not the ladies use UV top coat and UV curing to protect their finger nails. The lamps are typically called UV light nail dryer and the coat itself UV-cure top coat. ex. : www.amazon.com/OPI-Microbond-UV-Cure-Top-Coat/dp/B000NCVA90 This might be the cheapest solution of them all, particularly if the top coat for nails works also for playing cards. A different class of products that might work are wax and polish products for floors and for cars. I have not tried them myself but they could do the trick. Jeremy Rayner pointed out to me: "In 'Greater Magic' this is discussed at some length in the chapter called VIII Locations, starting at p105 in my edition with p110 describing how to apply floorwax and another allegedly superior ingredient called 'Simoniz'." The simplest and cheapest method is a straight edge, box cutter, and scissors. With the straight edge and box cutter you cut the sides and with the scissors you round the corners. With a bit of patience and a good eye you will be amazed at how well you can round corners. But it is not the ideal solution because the cuts are not burr free and the accuracy and repeatability is not sufficient for my personal quality standards. Cutting with a box cutter produces an asymmetric cut because the cutting process is asymmetrical - a knife presses from the top against a board. The top side of the cut is smooth, the bottom side has a burr. For playing cards this burr is a major problem. The cards don't slide as freely and easily as they do without the burr. You will have to sand the edges or treat them in some other way to remove the small burr. 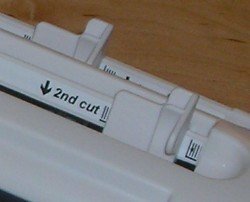 The straight edge and box cutter can be replaced with any other paper trimmer or cutter be it guillotine or roller based. The bigger challenge is to find a corner rounder with the correct radius (3mm or 1/8"). You can easily find corner rounders with 1/4" radius for a few dollars in various office supply stores or art stores on- and offline. But that is too big a radius. These 1/4" rounders can be used to create a corner short card, and are great for corner rounding jumbo cards, but are otherwise not very useful. You can find nice corner rounders in the $100 to $150 price range. These can cut several cards at the same time but are too expensive for an entry model or the casual DIY card maker. That is why I decided to source 3mm rounders directly from a tool manufacturer. Another great alternative is a die cutter that cuts out the entire card - edges and corners. You can even find ones that cut out 8 cards with one action. These die cutters do cost several hundred dollars. Be careful with the card size these cutters produce. Not all produce exactly poker sized cards. 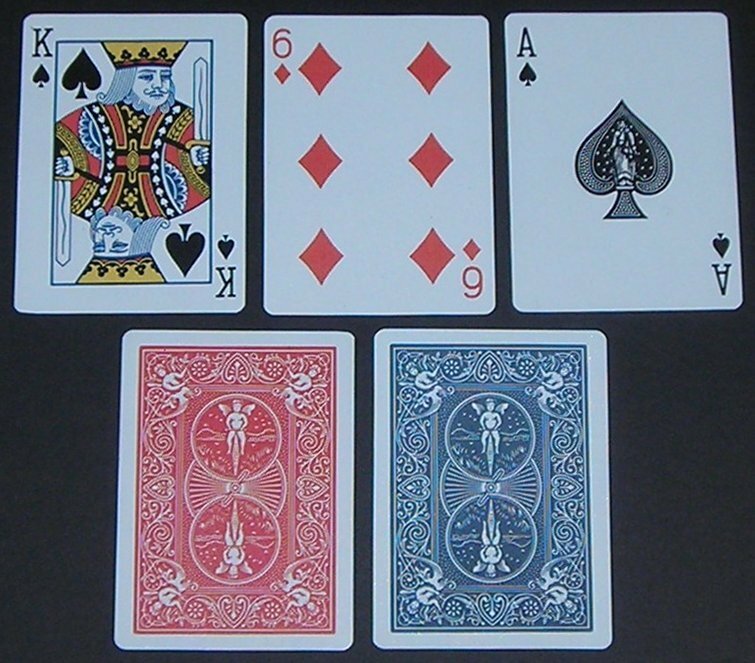 A poker size card is 63mm x 88mm, which is not exactly the same as 2.5" x 3.5". If you want to mix your custom cards with store bought cards, the size is key, otherwise you produce inadvertently long, short, wide or narrow cards. When cutting cards there is one other important aspect to consider. Every paper or cardboard has a fiber direction. Bending, cutting, tearing and creasing along the fiber direction is easier than across the fiber direction. More importantly the spring of a card depends on how the fibers run. 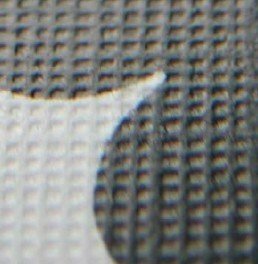 Typically sheets are cut with the fiber running along the long edge. Our playing card cardboard has the fiber direction parallel to the long edge. Playing cards also have most of the time the fiber of the cardboard run parallel to the long edge of the card. This means that you want to make sure that the long edges of your cards are parallel to the long edges of the cardboard sheet. To achieve this you could use a 9-up arrangement, or if that leaves too narrow margins around the cards for your printer and cutter setup you can use a 4-up configuration. If you don't mind how the paper fiber runs or if you deliberately want to have the fibers run across you can also use an 8-up configuration with the sheet in landscape. An interesting tool is the Xyron Creatopia. This is a tool that allows you to coat paper and cardboard with adhesives, laminate it, cut it, and emboss it - quite a range of tasks. The part that interested me most was the cutting because it allows one to change the number and position of cuts. However, I don't know if it can cut the thick playing card cardboard. And I think it would be quite a challange to set the cuts position exactly the same every time. Your cards would come out slightly different everytime you need to change the size. An exact size of the cards is crucial for most applications. One of the challenges is to align print (register front and backside) with the cut. The biggest variable here is the printer itself. The alignment and repeatability of a typical desktop printer is not that great. With my Brother laser printer I measured a misalignment of about 0.5 mm. The printer does not pull in the paper perfectly straight but slightly tilted. This causes the margins on the bottom of the sheet to become slightly asymmetric. For example, I printed out a block of 9 cards, 3 x 3, perfectly centered on the sheet. When I measure the margin on the left and right for the first top row I get precisely 10.5 mm on both sides. When I do the same measurement on the bottom for the last row I get 10 mm and 11 mm. So the printer drew in the sheet slightly tilted, causing the print to be slightly skewed on the page. Top and bottom margin were also not symmetric. On the top I get 15 mm on the bottom 18 mm. As long as you feed the sheet for front- and backside print with the same leading edge into the printer, this is not an issue. To facilitate this I make a dot on the leading edge of the sheet - the edge that enters the printer first. This way I know how to insert it for the backside print. Another test you can do is to print front and back and then use a needle to pierce through the cardboard and check how much off the front and backside prints are. With my printer the misalignment is not that big. In the worst case I can discard the last row of cards and use the top 6 cards which are aligned very well. And every now and then the print on the front and back is perfectly aligned. After you have printed a sheet on the front and on the back and perhaps coated it with a clear coat you need to align the paper guides of your card cutter with your print. For this you will have to sacrifice one or two sheets. First print out two identical sheets. Put the first one into the cutter and observe where the cuts come out. Then adjust the paper guides for the cutter accordingly. Make sure to feed the paper always in the same orientation and with the same leading edge into the cutter. Here the mark on one of the edges mentioned above will be very helpful. If the print is not exactly centered, which in most cases it will be, you will see large changes in cutting position for inconsistently inserted sheets. There are many tools and ways to design custom cards or gaff or trick cards. One that is free, easy to use and specific to designing playing cards is my online card designer. You can also use the following process that has worked well for me and produces very good results. If you want to avoid a lot of the legwork then you can also start with my design pack of all 52 faces of standard American cards as vector graphic files. Unless you want to design something from scratch it is best to start with an existing face or back design. Buy a fresh deck of cards and scan the card. I suggest to use 600dpi and true color but the range of possibilities is quite large and depends on what you ultimately want to do. I would stay away from digital cameras because they introduce all kinds of distortions. Use a paint program or a photo editing tool to clean up your scan. Often white does not come out a clean white and sometimes you want to crop and correct certain aspects of your scan. Save as PNG, TIFF or BMP file. These are better formats than JPG. JPG is a lossy compression format and does not reproduce sharp lines well. Combine or alter your scans to produce a trick card. The possibilities are endless. Staying in a pixelated world makes life easy but it limits your design options and the quality of the end product. I recommend to convert your bitmap to a vector graphic. Once a vector graphic, you can scale, stretch, bend, combine etc. your design at hearts length without loss of quality. It also makes it possible to separate elements of the design into colors to quickly change and tune colors. This is important if you want to match your trick card to an existing pack of cards. USPCC has a lousy quality control on their colors and you can buy cards with quite different shades of colors. To avoid having your gimmicked card stand out like a sore thumb tuning colors is sometimes necessary. I use a very nifty and free tool, Inkscape, to convert a bitmap to a vectorized graphic. It is a great tool that I can recommend if you want to do a good job designing your cards. If you have never used a vector graphic program then you will need to schedule some time to explore the possibilities of this tool. It is not hard to figure out what it can do. The boundaries are only set by your own imagination. If you do make some cool cards please let me know. Business cards: Print your own business cards on playing card cardstock. This is a high quality cardboard that will stand out from the rest of business cards. You don't need to cut it in the size and corner rounded like a playing card. You can cut it to the same size as a standard business card, or any other size you wish. 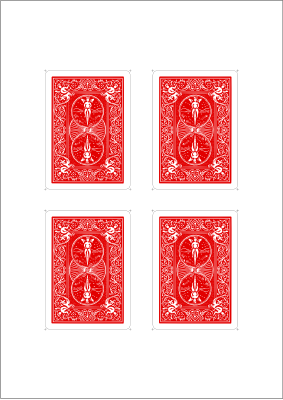 Custom Playing Cards: Why not print a deck of playing cards with faces to celebrate a certain occasion? Perhaps for the next family reunion print a deck that has pretty aunt Elizabeth as the Queen of Hearts, and handsome Peter as the Jack of Spades. Father or grandfather as one of the Kings ruling the family and I am sure any family has a Joker, too. It is fun to find the right people for each card. And you don't have to stick with a standard 52 deck of cards. Perhaps print custom trading cards for a special occasion. The ideas are limitless. Jumbo Gaff cards: Getting gaffed jumbo or giant cards is pretty much impossible. But now you can print your own cards up to A4 size. For stage work you could use one sheet for each card. Simply round the corners and you are done no further trimming or cutting necessary. Flash cards: Sure you could print flash cards on any paper or card stock, but printed on real playing card cardboard will make them handle much nicer and you will want to learn and handle them more often. I have not yet been able to locate a company that sells white (unprinted) tuckbox style card boxes. Some magic dealers sell empty Bicycle boxes for more than a box filled with cards - meaning a regular deck. Why would you buy for $2 or $3 an empty box when you can get for ~$1 a complete deck, cards and box combined? The best option is to make your own. And the best tool to do so was pointed out to me by Sandy Singer. It is the Super Delux Tuckbox Template Maker by Craig P. Forbes. It is incredible and allows you to specify the size of your deck, the bottom style and in an instant a PDF is made available for you to print, cut, fold and glue into a perfect card box. Rough Cards: To make rough-and-smooth cards use Krylon Matte 1311 spray. To prevent cards from flying away during application build a little tray where each card has its own compartment to snuggly fit into. If each compartment has a hole then you can easily remove the card by sticking your finger through the hole from the back. Preparing Cards for application of rub on transfers: Use steel wool 0000 (the finest one available) and lightly roughen with it the coating. This will give the transfers a better surface to stick to. Improve the free online gaff design tool. More testing on different printers. Experimenting with different ways to apply the coating. Convincing a printer manufacturer to produce a small desktop printer that can print and coat a single card. Best is to go to ebay and search for 'die cutter'. You will find some choices. Or Google it. There are several who supply these die cutters. However, be careful about the exact size of these cutters. They are typically not exactly poker size. Yes, Keith, I could offer a very similar cardboard that has a smooth surface. Actually I was thinking about that for a while and at some point I am quite sure I will be able to supply it. But at the moment I am concentrating my resources on other parts of the card making process, namely the design phase where I want to offer a free online design tool for gaffed cards. Chris, Do you still recomend the Brother 4070, or is there another model you'd recomend these days? Thanks! You may want to create the cards described in Karl Fulves' book "Ellis Stanyon's Best Card Tricks". Check chapter 9: Card Tricks Using Special Printed Cards and chapter 10: Mechanical and Other Prepared Cards. There is no need to print you own double face and double back cards. You may peel cards, to create these ones. You may find instructions to do it in Expert Card Technique, by Jean Hugard and Frederick Braué. Just check Part 5, Miscellany, Peeling Cards. Note: use spray adhesive instead of rubber cement. It is much better, but it was not available when the book was published and, therefore, it is not mentioned in the book. I've wanted to make my own gaffs and specially designed cards for magic routines for about 20 years. I've hand made a lot of gaffs, but no more. Thanks! Hey Chris, What a great article this is! The card designer is great, however if I want to export normal pip-cards (for further editing in Gimp for example) the export fails. Face-cards are all great. but just 2-10 gives me a fail every time. no matter what suit. I've tried on PC, I've tried on MAC, same: no luck. Is this a knows issue? At the bottom of the article you write you want to improve the free gaff-design tool. maybe there are others out there that can help too? any suggestions? Hi I was wondering how thick the card-stock you sell is? I am looking to make a few homemade copies of some magic the gathering cards i have. I think the thickness of regular bicycles might be a bit too thin. Do you have any thicker card stock or know of a place i could get some? haven't gotten anything from there yet so "caveat emptor!" curious if a Brother MFC printer would still work for this printing process??? I'm assuming so but just making sure. thanks! That's really amazing you printed your cards & definitely its not difficult creating playing cards at home as we think. Well you put nice efforts, thanks for sharing. The Bicycle backdesign is trademarked and therefore I can't provide it to you. Depending on how you intend to use it you may still be able to use it, but you will need to do it yourself. Hello Christoph. I want to make my cards but would need to insert a RFID tag inside. If I understand well, the paper you offer are already with the black glue in the middle. Do you have an idea of how I could get the paper without the black glue, and my nfc tag, and glue them myself ? Is there any way to get the Air-Cushion finish paper without the glue and therefor thinner ? 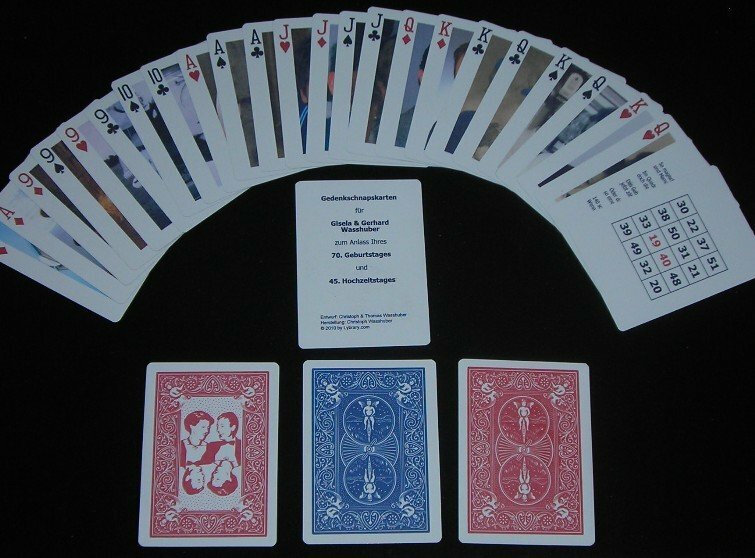 Hi Chris I've always used Bicycle Bridge Cards but unfortunately due the popularity of Poker Sized Cards the supply of Magicians Gaffed/Special Cards are now hard to find. I do have a source for the printing of gaffed/special decks - can I create my own gaffed face designs and use standard bicycle bridge back images to do so as this is the only alternative I have.